Do you need your roof repaired in Humble? A roof is constantly exposed to the sun, strong winds, and other harsh weather conditions. Over time, all of these elements can damage the surface of your roof. M Roofing, LLC, Harris County's roof repair professionals, have been repairing Humble roofs since 2000. We are Texas licensed, bonded, and insured to provide top quality roofing services in Humble, Texas. All of our roofers are Texas certified to provide Humble residential roof repair. Call (832) 856-3853 for a comprehensive, no-cost Humble roof repair estimate. Humble roof repair is less expensive than roof replacement. Worn, cracked, or curled shingles need to be repaired quickly to minimize the potential for more extensive damage to your Humble roof and even your home's interior. Once a Humble roof surface has been compromised, your roof is at risk for rotted sheathing and structural damage. If your roof has been damaged, call (832) 856-3853 for expert roof repair by the roofing professionals at M Roofing, LLC. Humble roof damage resulting from normal wear and tear, falling branches or trees, heavy snow, ice dams, fires, and even animals can be repaired by Humble's roof repair specialists at M Roofing, LLC. 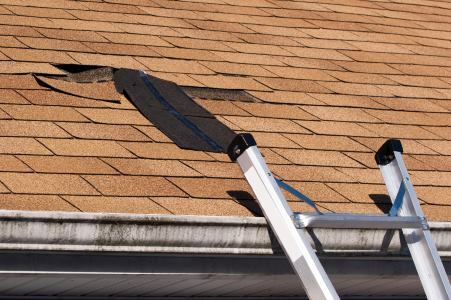 If your Humble roof damage is covered by your home owner's insurance policy, we can assist with the claims process to ensure that your claim is processed efficiently. M Roofing, LLC specializes in Humble residential roof repair for all types of roofs, including: asphalt or cedar shingles, tile, metal, and copper. Call (832) 856-3853 for expert residential roof repair in Humble, Texas. 5★★★★★ - "Great work and customer service." 5★★★★★ - "M Roofing team delivered what they promised on the quote and more. Cleaned up after themselves and put up a beautiful roof. Have gotten a few compliments since the work by M Roofing. Thank you." 5★★★★★ - "My experience with M Roofing was very pleasing! M Roofing did a fantastic job on my roof!! Mike Eason is not only a fair man but an honest man as well!! His prices are very reasonable and his work is excellent!! HIGHLY RECOMMENDED!!5-STARS!!" 5★★★★★ - "Would recommend M Roofing to anyone needing a roof and have professional, timely, and good craftsmanship demonstrated by all affiliated wit h this company." 5★★★★★ - "The work was professional and timely. Did the extras without the request." 5★★★★★ - "excellent all the way around. The workers worked very hard, especially in this heat. Michael, the owner, was very respectful and answered all my questions quickly and honestly. Down to earth guy who isn't trying to just make money. Will recommend to anyone I know." 5★★★★★ - "From the estimate to project completion, Michael and his team were wonderful!! I would definitely recommend them to my family and friends for their roofing needs. Michael kept me informed throughout the entire process and answered all of my questions." 5★★★★★ - "First of all our experience with Michael Eason was absolutely excellent! We could not be happier with the professional service and quality of safe work along with attention to detail provided with our new roof. Everything mentioned prior to work beginning was without question delivered as promised. We would definitely recommend M. Roofing to anyone in need of a quality, reliable, and dependable services from this company and outstanding crew." 5★★★★★ - "Quality work! Very prompt. Exceptional customer service." 5★★★★★ - "My Roof looks wonderful." "They did a really good job. Everyone was really professional and cleaned up after themselves."